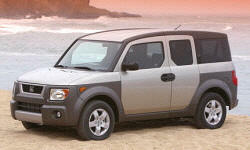 Why the 2003 Honda Element? Currently have 78K miles with only one minor repair which was a replaced shock absorber. Tons of room. Seats up or seats down, it works! Nice ride with lots of room. Nothing has broken. Materials are not "cheap." Why Not the 2003 Honda Element? The boxy style is not conducive to a quiet ride. Crosswinds knock the car around quite a bit. If the steering wheel is lowered to a straight up and down upright position, you cannot see the gauges. Blind spots in the rear and at the front windshield posts. It stinks! The EX is a bit heavy which drags the MPG to 21/25.